Camping chairs usually put their folding functionality before comfort, resulting in a seat that's easy to transport, though, not ideal for lazy weekend lounging. But the Mantis perfectly blends both form and function with a laidback design that packs away small enough to stash in a backpack. 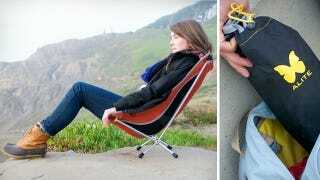 At $120 you'll be paying a premium for the seat that weighs less than two pounds, but when assembled it can support campers up to 250 pounds, providing what looks to be the most comfortable spot to kick back in at any campsite. And if you run out of bunks or sleeping bags, we're pretty sure it wouldn't take much to doze off in this recliner. After all, isn't the real reason for camping to sleep through mother nature's majesty?